Finding ways to relieve your stomach troubles can be difficult. Digestive issues can be distressing and may need to be addresses, but many medications may cause side effects that make them do more harm than good. 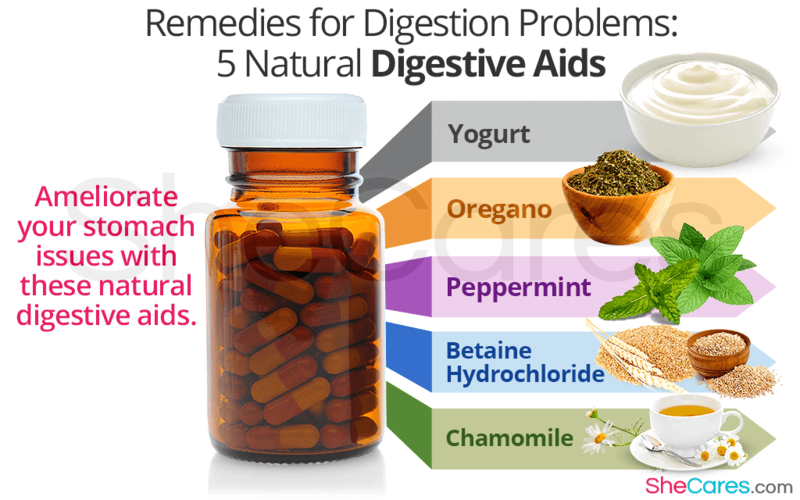 If you want different types of digestion remedies to help your stomach, you may want to try natural digestive aids. Not all types of yogurt are good for digestion, but many yogurts contain certain types of bacteria that are actually beneficial to the intestines, often called probiotics. The intestines already house a large number of good bacteria that help them to break down food and digest it. Eating yogurts that provide these bacteria, especially lactobacillus, can help your digestive system work better and relieve symptoms of any problems. Although it is better known as a seasoning, oregano can be a very useful herb in helping manage the symptoms of certain digestive illnesses. While there is some support for its ability to eradicate intestinal parasites, it has been used with better results for conditions such as bloating and heartburn. Many people love the taste of peppermint, which would make it popular even without its many benefits for digestion. As a natural digestive aid, it can help conditions like gas, bloating, or even irritable bowel syndrome. It does this by relaxing the muscles in the digestive system, allowing gas and food to pass more easily. It can also improve the flow of bile, which improves the body's ability to digest fats. However, peppermint may increase symptoms of acid reflux, so people with heartburn should use caution. This is a compound that is often found in foods like beets, although it is often made in labs in order to be taken alone as a supplement. It provides the body with extra hydrochloride, which is important in proper digestion, in a safe manner. This can help people whose bodies are having difficulty digesting foods normally due to a lack of the proper digestive acids. Chamomile is well-known for its ability to help us sleep, but it can also be used as a digestion remedy. Like peppermint, it can help relax muscles, and it is especially useful in relaxing muscle contractions in the smooth muscle of the intestines. It is used for indigestion along with improving the symptoms of cramps, irritable bowel syndrome, diarrhea, gas, and even colic. With these natural digestive aids, you will be able to help ameliorate your stomach issues without having to resort to prescription medications. Be sure to consult a doctor if you experience any stomach problems associated with bleeding or with stomach injuries. Read about other ways to improve digestion.